Like in almost every market segment, the high-end business segment is oversaturated with plenty of options to choose from. 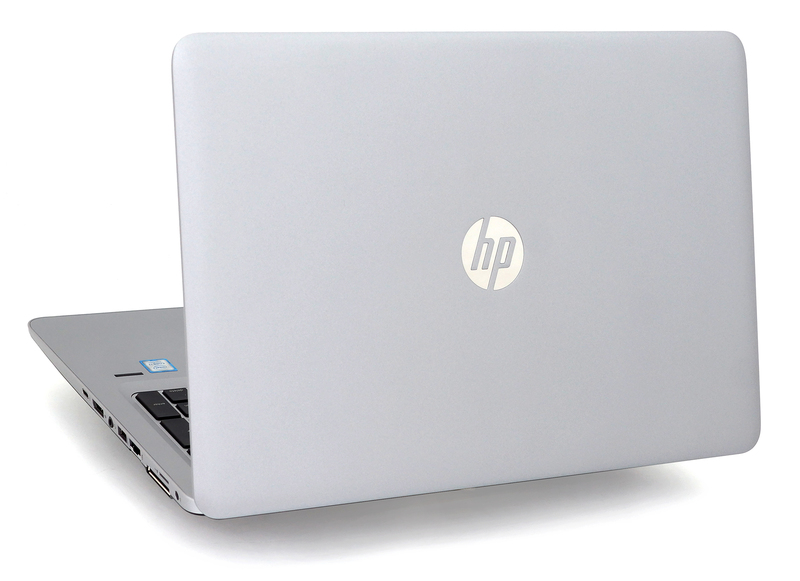 HP’s EliteBook series have always been there and remain as one of the first go-to options when looking for a business solution. However, today’s standards have changed quite a lot and hard to keep up with the competition. While the EliteBook 850 G4 that we will be reviewing in this piece is seemingly an excellent business solution with plenty of advantages over some of its competitors, it fails to meet our expectations in one key aspect – image quality. 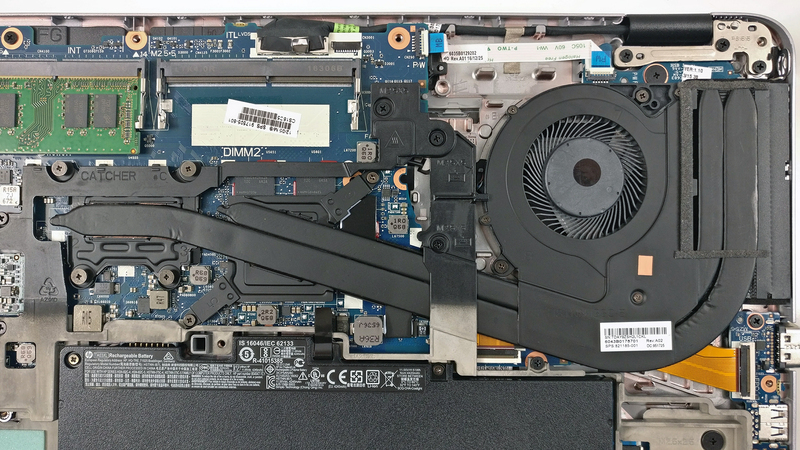 While the inclusion of an IPS panel in a business-oriented laptop isn’t a necessity, it has become a standard for mid-range to high-end notebooks and we are pretty disappointed by the fact that the EliteBook 850 G4 is missing on this. For comparison, the Lenovo ThinkPad T570, Acer’s TravelMate P658 and Dell’s Latitude E5570 are all similarly priced and boast excellent IPS displays with high brightness, great contrast and wide sRGB coverage. They can even be used for multimedia, not only for work. 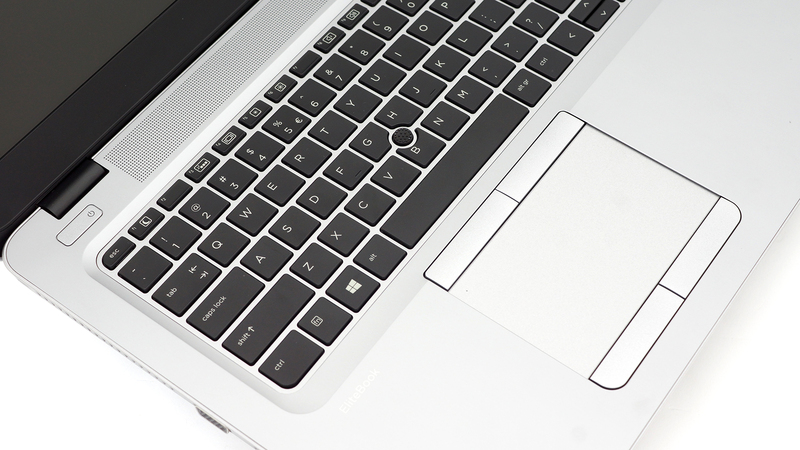 In any case, the EliteBook 850 G4 holds up to the competition with good build quality, great battery runtimes, comfortable input devices and a few other key deciding factors that need to be considered. Read the full review below. The box, in which the laptop ships, contains all the usual user manuals, AC adapter and power cord. Nothing out of the ordinary. The majority of the casing uses plastic but the base is made of magnesium alloy and anodized aluminum for the interior. This has resulted in a well-built chassis with little left to complain about. And although the ThinkPad T570 and the Latitude E5570 feel more premium and probably look better (this is more of subjective opinion after all), the EliteBook 850 G4 is lighter and thinner than both of them. Still, in terms of sturdiness, the EliteBook 850 G4 doesn’t fall behind its rivals. Probably the only relatively weak spot would be the lid. It’s made of patterned, slightly roughened plastic finish but it’s surprisingly resistant to torsion and bending. When the center of the plate is pressed, the surface gives in ever so slightly. As for the hinges, they appear to have a firm grip over the lid and we didn’t notice any rocking or unnecessary sway. They are also well-tightened and allow opening the notebook with one hand. 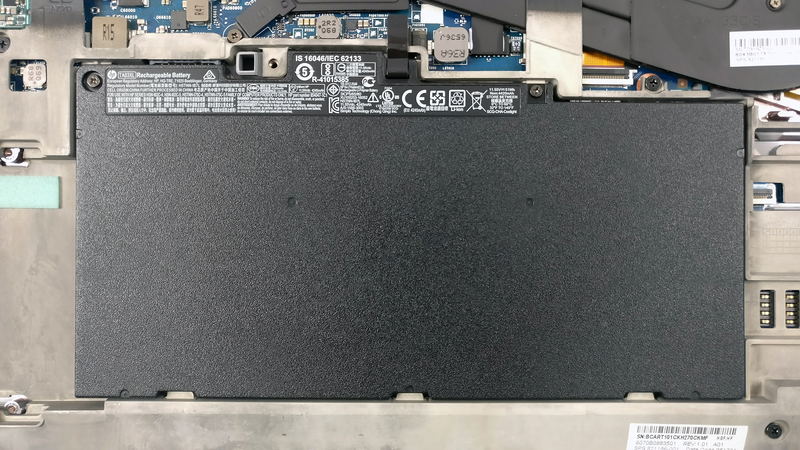 The bottom of the laptop features a black roughened plastic with a big vent opening for extra airflow but no dedicated maintenance hatch. Going around the sides, we find the usual set of connectors crammed on 19.4 mm thin profile. On the left, you can see the main heat dispersion grill, a VGA connector (don’t know who’s still using this one), a smart card reader and a standard USB 3.0 port. The right side accommodates the rest of the connectors – USB-C 3.1 (Gen2), DisplayPort, 3.5 mm audio jack, USB 3.0, RJ-45 LAN port and a SIM card tray. Right under it, you will find the docking port if you find yourself needing the extra connectivity options. The only thing missing here, however, is the HDMI connector, which is way more common nowadays than the VGA and DisplayPort so it’s quite the mystery HP didn’t include it. 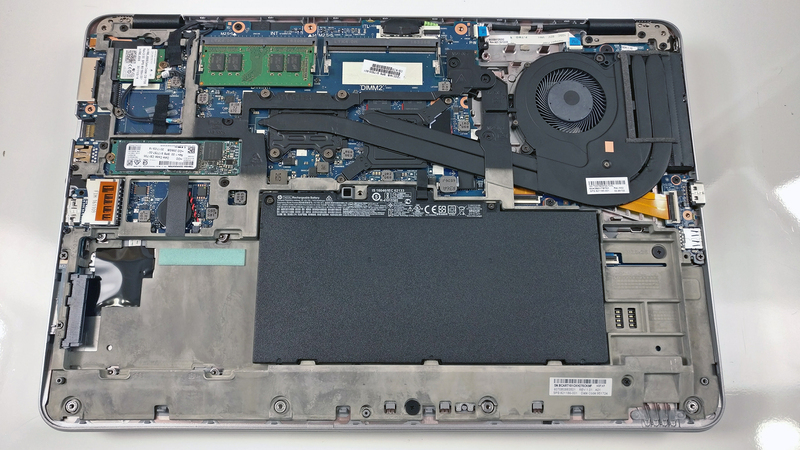 The interior is where this laptop excels with almost nothing to complain about. The base plate uses anodized aluminum that’s rigid enough to withstand pressure and twisting. Moreover, it doesn’t attract smudges and fingerprints. Regarding the input devices, they are just great, however, we weren’t expecting anything less in the first place. The keyboard has relatively long key travel with clicky tactile feedback making it excellent for typing. Only the “B” key is a little bit small as it makes some room for the track stick. Still, we didn’t notice any problems with this particular key when typing. The touchpad appears to be responsive with excellent gliding surface and the mouse keys are an absolute delight to work on. The same goes for the dedicated mouse buttons for the track stick positioned below the spacebar. The bad news is that the notebook doesn’t offer any service lids for easy upgrades but you can get rid of the bottom piece quite easily anyway. 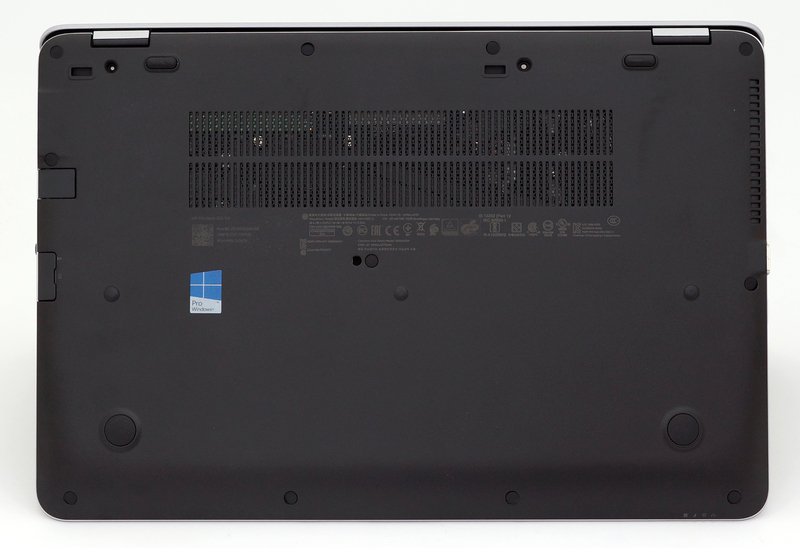 As expected, the laptop offers an M.2 SSD slot and a standard 2.5-inch HDD/SSD slot. 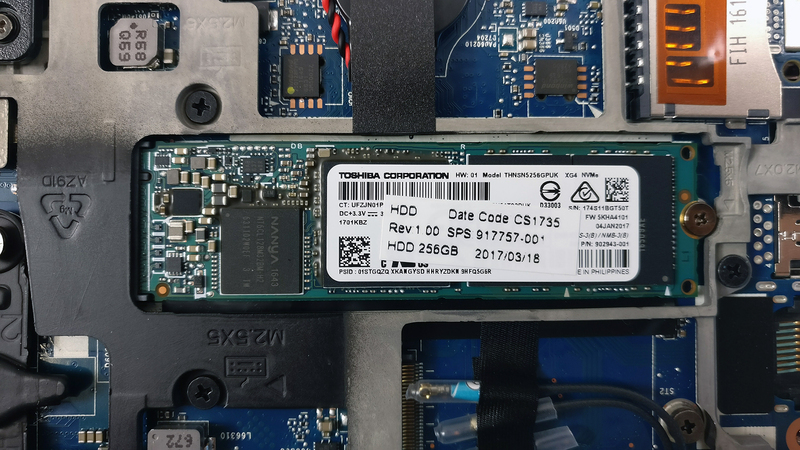 Our unit came with an M.2 PCIe NVMe SSD from Toshiba while the 2.5-inch drive bay turned out to be empty. The latter is located right next to the battery. The motherboard supports up to two RAM chips each going up to 16GB. 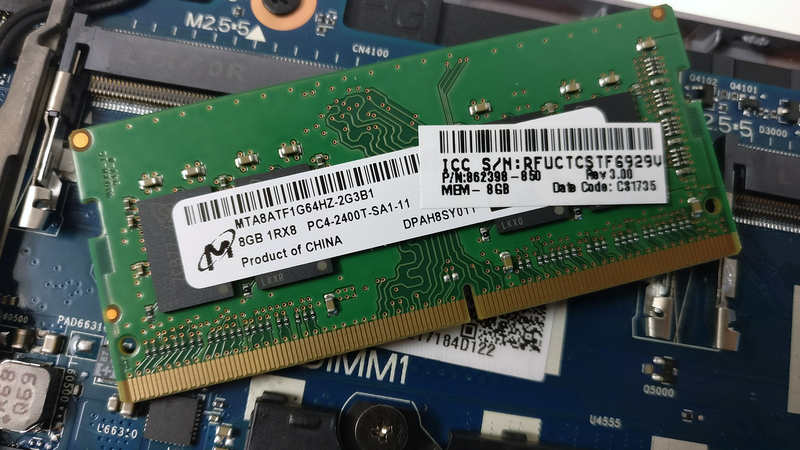 Our unit, however, came with the usual 8GB DDR4-2400 chip from Micron leaving the other slot free for upgrade. 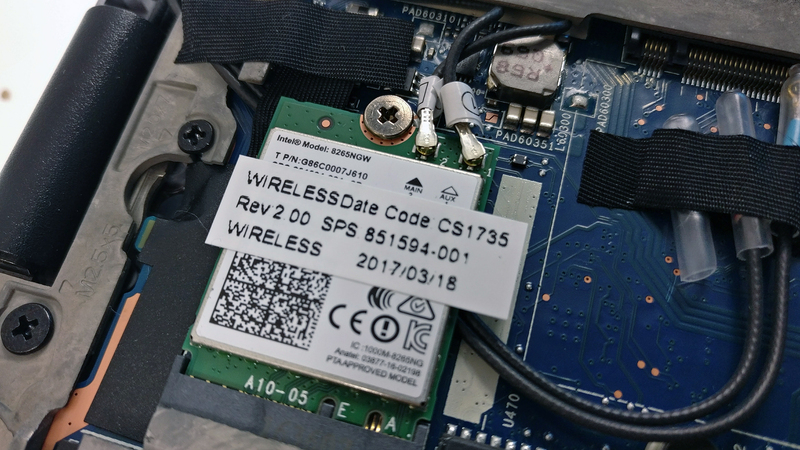 The Wi-Fi module can be found near the RAM chips and it’s Intel 8265NGW. 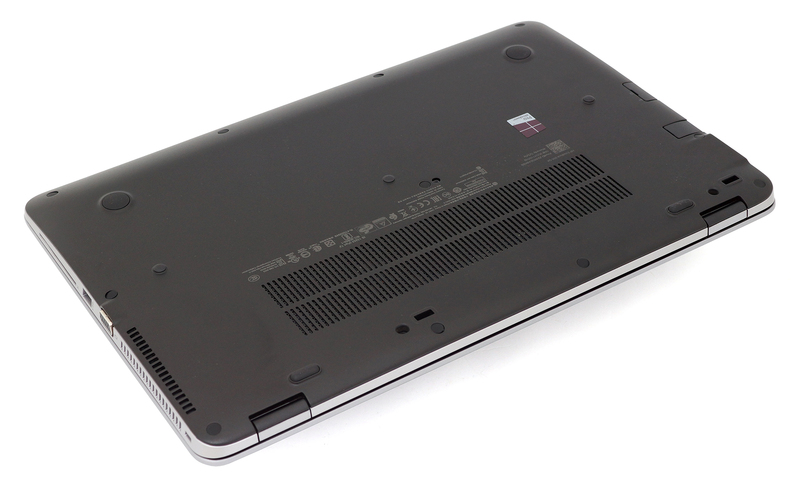 The notebook comes with a big 51Wh battery, although looking at the chassis inside, a bigger one can fit in. The cooling system isn’t anything special and consists of one big cooling fan and two heat pipes. One of them is bigger than the other and connects the GPU’s heatsink while the other is for the CPU. Our temperature tests confirm that given the hardware, the system should do just fine. 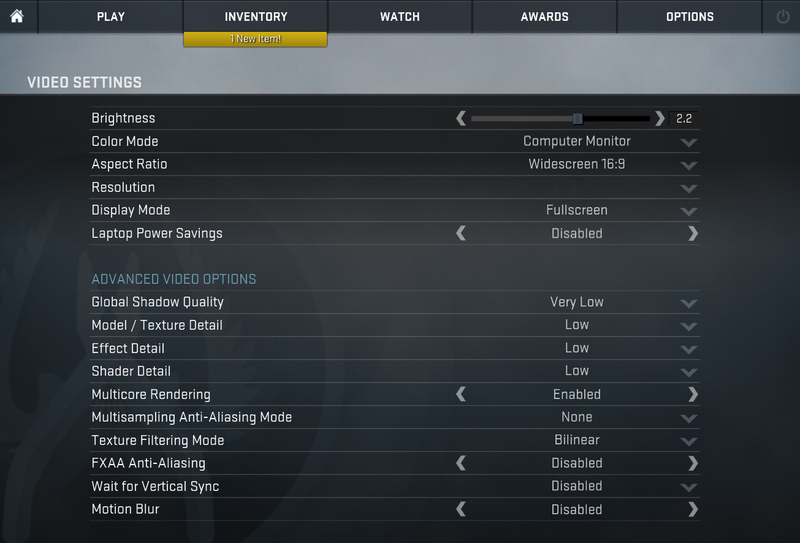 The laptop uses an AU Optronics Full HD (1920×1080) TN AUO35ED panel with 142 ppi and 0.18 x 0.18 mm pixel pitch. It can be considered as “Retina” when viewed from a distance equal or greater than 60 cm. We’ve recorded an unusual maximum brightness for a TN display – 354 cd/m2 in the center of the screen and 354 cd/m2 as average with just 6% deviation. The color temperature on a white background at maximum brightness is 6800K which is close to the optimal 6500K but as we go along the grayscale, the color temperature can go above 12000K – really cold color reproduction. Our custom profiles take care of that. Below you can see the results at 140 cd/m2 (70% brightness). The maximum color deviation dE2000 is 2.9, which isn’t all that bad since values above 4.0 are unwanted. 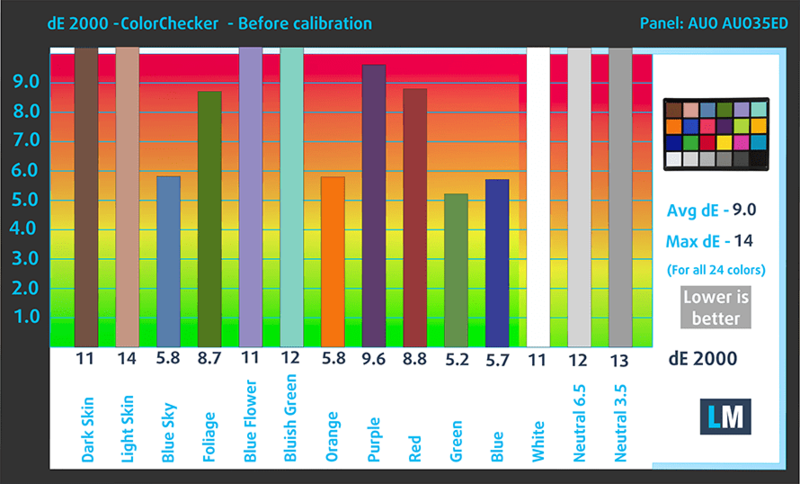 The contrast ratio is 330:1 before calibration and 300:1 after calibration. 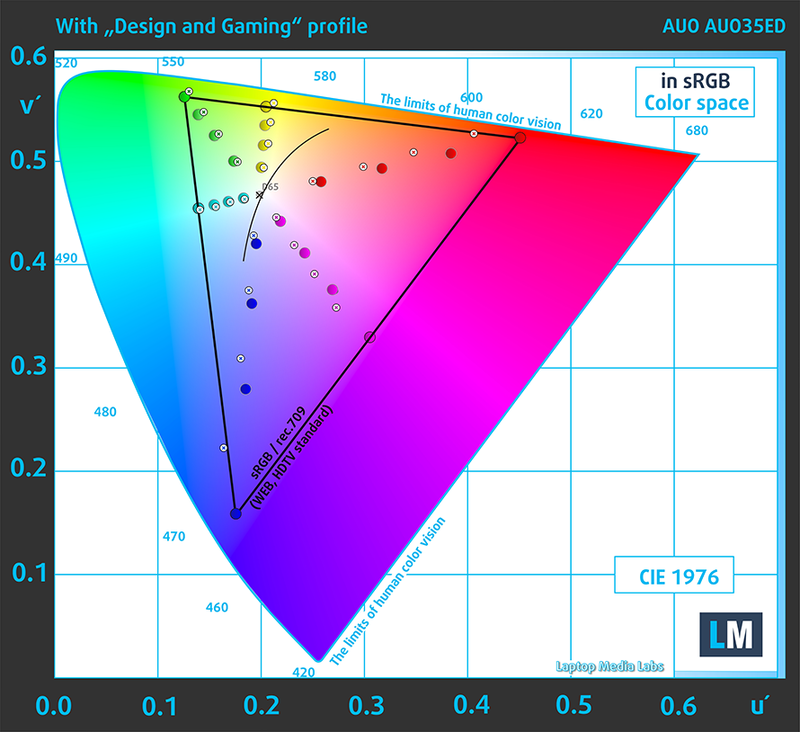 The notebook’s display covers just 63% of the sRGB gamut so it won’t be suitable anything more than general browsing and office work. We recorded Fall Time + Rise Time = 14 ms. Although the notebook’s display isn’t completely flicker-free, it’s still good for extended use as the PWM appears only below 100 cd/m2 luminance (30% screen brightness). You won’t be using the display lower than that anyway. We are pretty disappointed by the HP EliteBook 850 G4’s panel because given the price tag, HP should have used a budget IPS display at the very least. With the present TN panel, you get poor viewing angles, narrow sRGB coverage and awful contrast. However, we were surprised to see the panel being really bright and the absence of PWM above 30% brightness is a big plus to consider. 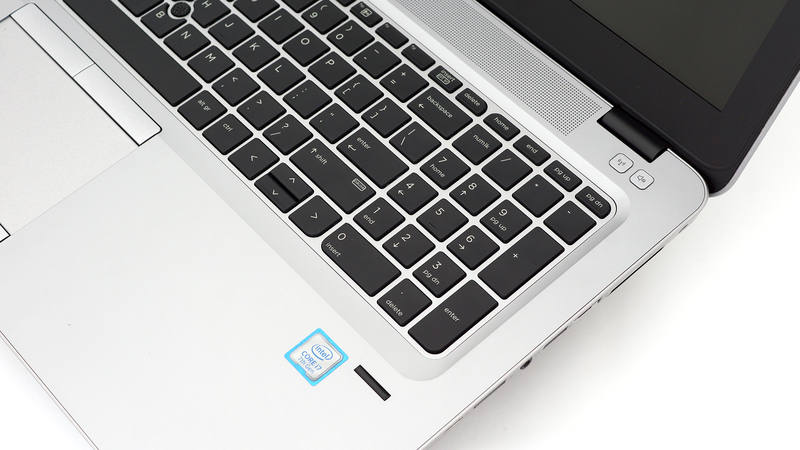 The EliteBook 850 G4’s sound is loud and there’s enough clarity in the low, mid and high frequencies with barely noticeable distortion. We used the pre-installed Windows 10 (64-bit) for the writing of this review but if you wish to perform a clean install and get rid of the bloatware, we suggest downloading all of the latest drivers from HP’s official support page. 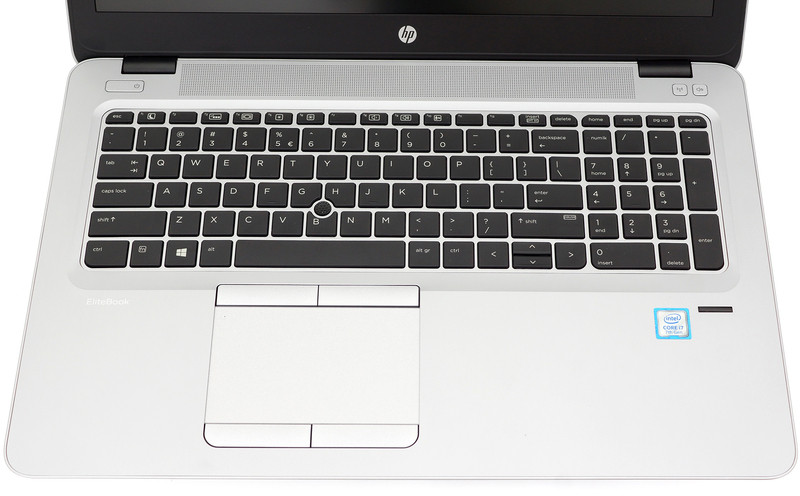 To be honest, we are not expecting anything less than excellent battery endurance from a high-end business laptop but the HP EliteBook 850 G4 shows impressive energy-efficiency for a 15-inch laptop. Probably the main reason for such long battery runtimes is the TN panel, which is less power-hungry than the IPS alternative. Anyway, the battery is rated at 51Wh, which is more than enough for a business-grade 15-inch laptop. Excellent result for a 15-inch laptop – 660 minutes (11 hours). Surprisingly, the video playback test returned a higher than usual score – 677 minutes (11 hours and 17 minutes). Of course, the laptop isn’t made for gaming but it’s good to know that it can a little over three hours under heavy workload – 221 minutes (3 hours and 41 minutes). Here you can see an approximate comparison between the CPUs that can be found in the HP EliteBook 850 G4 models on the market. 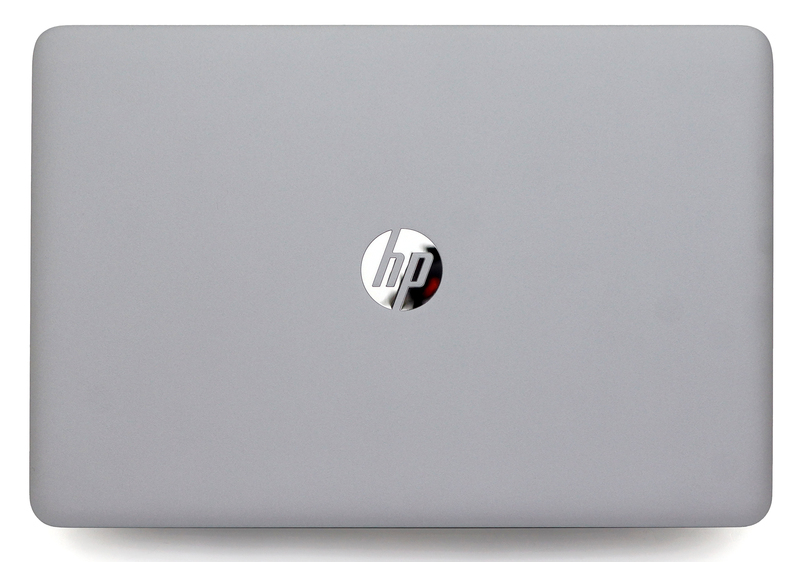 This way you can decide for yourself which HP EliteBook 850 G4 model is the best bang for your buck. The AMD Radeon R7 M465 is a low-end graphics card released in mid-2016 built on a 28nm process. 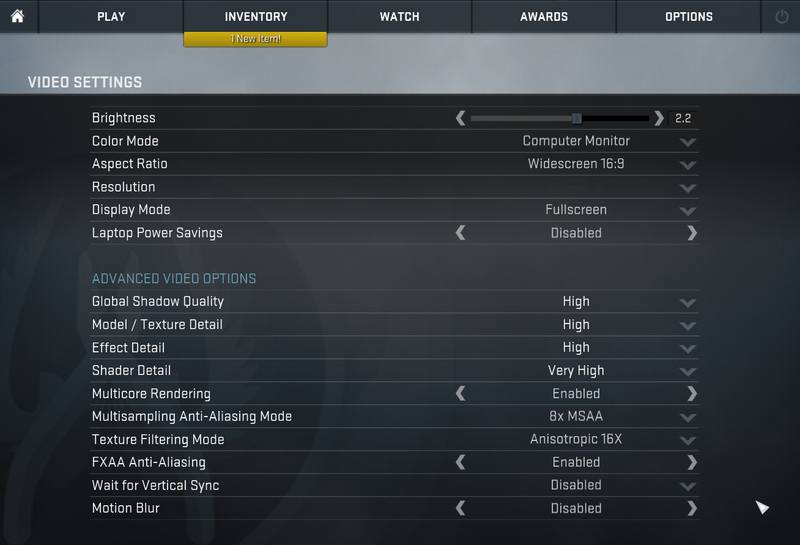 It has 384 shading units clocked at 825 MHz but can go as high as 960 MHz. The rest of the specs include 24 TMUs, 8 ROPs and 128-bit memory controller for the 2GB of GDDR5 VRAM clocked at 1000 MHz but keep in mind that the most of the variants out there feature a 4GB of DDR3 memory. 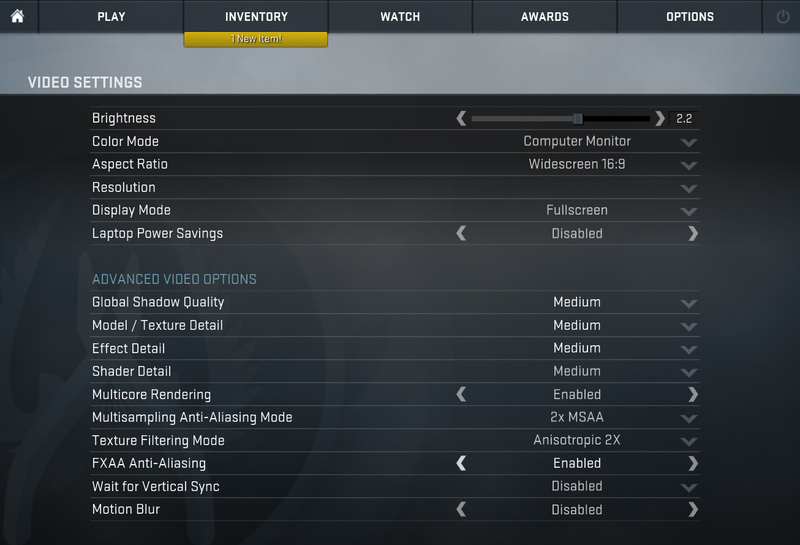 Although the core architecture is GCN 1.0, the GPU supports OpenGL 4.5 and DirectX 12. Here you can see an approximate comparison between the GPUs that can be found in the HP EliteBook 850 G4 models on the market. 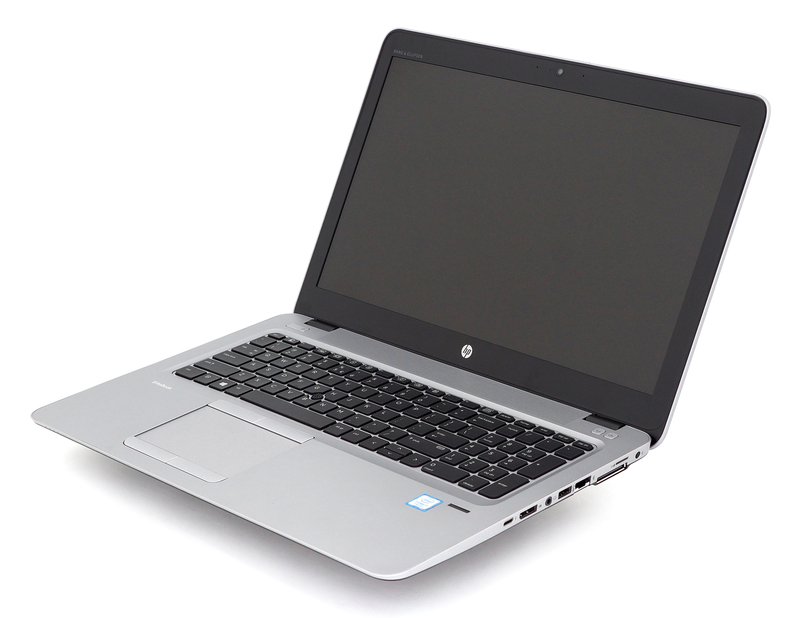 This way you can decide for yourself which HP EliteBook 850 G4 model is the best bang for your buck. Of course, the stress tests that we run do not represent real-life usage scenarios but they are still a great way to determine the overall effectiveness and stability of the cooling system in the long run. We started off with 100% CPU test and the Core i7-7500U was able to run at its maximum frequency for a while then dropped to 3.0 GHz keeping relatively low and stable temperatures. 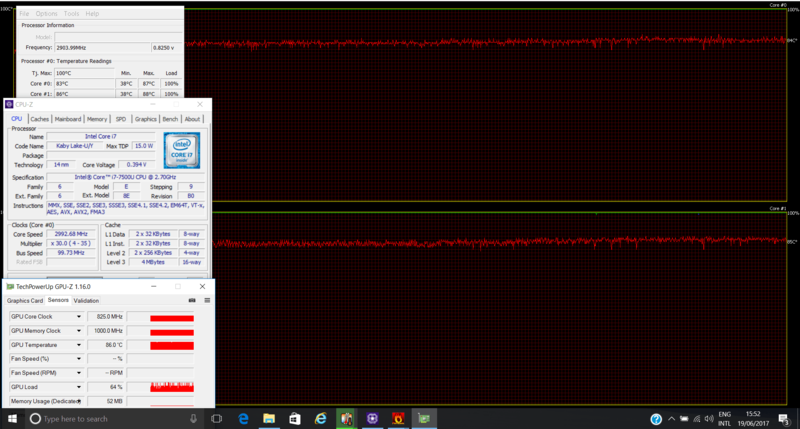 After we turned on the GPU torture test, the CPU started to get a little bit warm while the GPU was only able to run at its base 825 MHz frequency. However, we noticed that the GPU was running exceptionally hot – even high-performance GPUs in gaming laptops don’t reach 86 °C. We think that the cooling system isn’t entirely responsible for the high temperatures but the nature of the GPU itself. 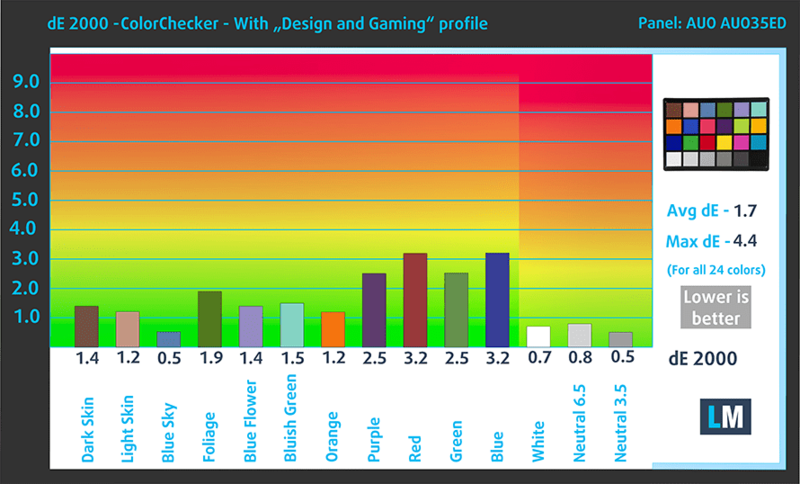 We often find low-grade AMD mobile chips running pretty hot during load on other notebooks as well. Temperatures on the surface were also pretty high reaching as high as 53.5 °C. Again, that’s a rare occurrence even for gaming machines. The EliteBook 850 G4 fits quite well the premium business profile but fails to impress in some key areas considering the asking price. 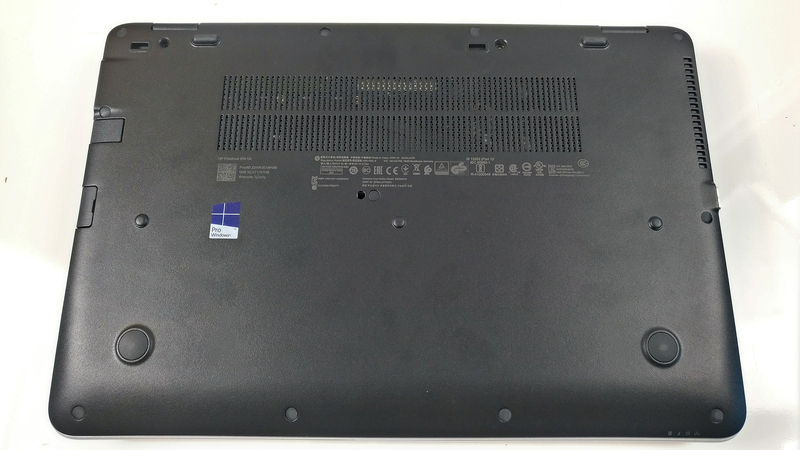 For starters, the feel of the laptop doesn’t really exude quality with the almost entirely plastic build and generic roughened plastic finish on the bottom. Still, this doesn’t take away the rigidity and the notebook appears to be quite sturdy. 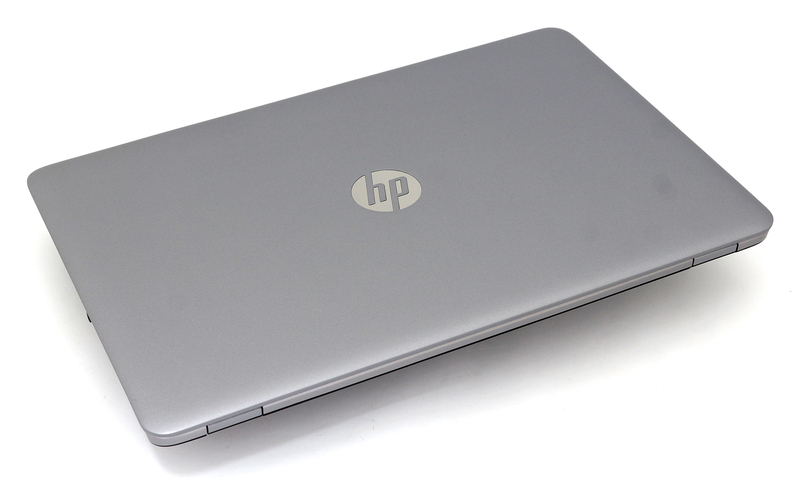 Also, we are fairly impressed by the dimensions and weight – for a 15-inch laptop, the EliteBook 850 G4 portable. What else would you want from a business notebook? Good input devices and long battery life. Well, luckily, the EliteBook 850 G4 delivers both with ease. This is one of the most enduring 15-inch notebooks we’ve tested so far and the input devices are just great for work on the go. But for the long battery life, you will have to pay a price and that’s the screen quality. 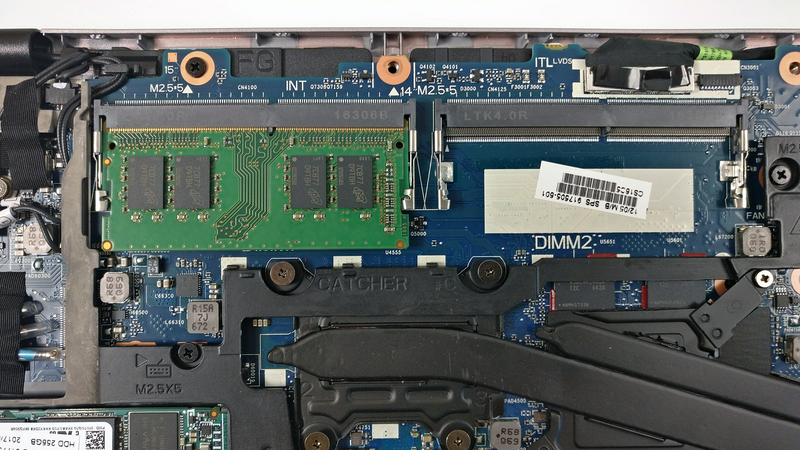 Probably one of the main reasons this laptop fares so well in our battery tests is the TN panel. Usually, laptops priced above a certain point (€800-900) sport IPS panels but the EliteBook 850 G4 starts at €1 300 and disappoints with a budget TN panel with narrow sRGB coverage, extremely low contrast ratio and poor viewing angles. The only two things that stand out are the maximum brightness and the absence of PWM above 100 cd/m2 (30% brightness).